For one week at least, the Patriots have calmed the fears of fans of New England as they broke a two-game losing skid in dominant fashion, demolishing the not-ready-for-primetime Miami Dolphins 38-7. On Sunday afternoon, Miami came in riding high at 3-0 while the Pats limped in at 1-2 and much was made of whether the Patriots defense, which seemed slow and unathletic would be able to keep up with the team speed of Miami. The defense answered the bell today and Miami never seriously threatened to score until a garbage time drive by their backup quarterback as New England dominated in all three phases of the game. The Patriots won the physical game up front, both the offensive and defensive lines clearly won the 1-on-1 matchups as the Pats rolled for 175 yards on the ground, springing Sony Michel and James White for big chunks of yardage all game long, something that had been sorely missing for the past two weeks. Michel who was foolishly labeled a draft bust by the hot takes crowd after just two weeks and after having missed all of the preseason rushed for 112 yards on 25 carries with a touchdown. White had 112 yards from scrimmage with 44 yards rushing, 68 yards receiving and had a touchdown rushing and receiving. Defensively, the Patriots front seven stuffed the Dolphins on early downs, putting QB Ryan Tannehill in third and long situations all game long. Of course, getting two of their best defenders in Trey Flowers and Pat Chung back helped. We wrote in our pregame matchups that the defense had to get out of early holes that made third-down conversions easy. Tannehill faced third downs needing 12, 10, 10 (converted via penalty), 13, 8 and 24 yards in the pivotal first half. That is much, much better. Miami was only 1-6 on third down in the first half, and that came as the half was winding down and the defense was giving them the underneath stuff. By the time the first 30 minutes were over, the game was over with the Patriots going into intermission with a 24-0 lead. Even more encouraging, the passing game got going against a very good Dolphins secondary. 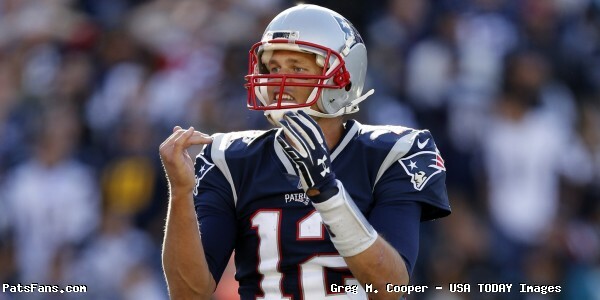 Tom Brady threw for 274 yards and three touchdowns but they got the big chunk plays that they’ve been missing. Brady hit Cordarrelle Patterson for a 55-yard touchdown, James White and Phillip Dorsett who caught a somersaulting 9-yard touchdown pass from Brady rounded out the scoring. After having no success throwing to his wide receivers thru the first three weeks, they contributed 10 receptions for 166 yards. Hardly earthshattering numbers, but much better. 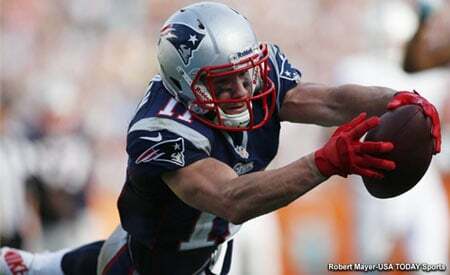 And with the news that Julian Edelman returns on Monday, this should have an immediate impact on the passing game. Newcomer Josh Gordon played only 18 snaps but did have an immediate impact. He caught two passes for 32 yards, both third-down conversions, and drew a penalty giving the offense another first down. But perhaps the best indicator from him was the nice block he made downfield on White’s 22-yard touchdown run. That is something the Patriots pride themselves on with the WRs and it is an early sign that Gordon is buying in. The Patriots offensive line looked much, much better in springing the backs this week, and giving them the needed space to make the tough yards inside where they like to run and after the criticism, they’ve had to endure the past few weeks, this was a big, bounce-back game. Defensively, the line was penetrating, Miami had nowhere to run, with most of their 56 yards rushing coming long after this one was settled. Again in the pivotal first half, Miami rushed six times for seven yards. The Dolphins had just 172 yards of offense, 75 of which came on the final garbage time drive led by backup QB Brock Osweiler where they scored with under three minutes to go. Tannehill, who entered the game completing 72 percent of his throws and with a passer rating of 121.8, completed just 11-20 for 100 yards with no touchdowns and an Interception. Although he was sacked just twice, the Patriots had good pressure around the pocket all day where he wasn’t able to step into his throws all day. That’s why it seemed many of his passes sailed on him. His best throw was on the first snap of the game, where he drilled a 22-yard pass to Kenny Stills right between two defenders. That would be the Dolphins longest play of the day. The Patriots defense allowed just 3.1 yards per rush and 4.3 yards per pass. Malcom Brown had a big bounce-back game as well as Dont’a Hightower. Lawrence Guy and Kyle Van Noy were particularly very good for the defense, who got solid contributions from everyone in the secondary, including rookie J.C. Jackson who got his first NFL interception on a pass that Tannehill underthrew a bit on a deep fly. UP: Unlike a week ago, we could easily name several players here, and will add on to our three up just a tad this week. Sony Michel: Imagine a rookie 1st round running back being labeled a bust after just two games when that back missed all of the preseason. Welcome to the world of New England overreaction sports radio. Michel looked much more comfortable in the Patriots offense this week and was showing more and more flashes of why the team thought so highly of him with a very solid performance. Michel had 112 yards on 25 carries with a TD in the best game of his young career and quieted the critics for a week at least. As he gets more comfortable out there, his vision will continue to improve and we’re starting to see that burst he was so known for at Georgia. James White: Last week, Tom Brady lamented that the coaches needed to get White more involved in the offense as he’s always a big playmaker. Mission accomplished. White had a typically big-play day with a 22-yard touchdown run and a 14-yard touchdown reception where Brady dropped a dime in the corner of the end zone as he was getting drilled. Lawrence Guy: The big man inside is always one of the more underrated members of the Patriots defense and on Sunday afternoon he contributed big time to the overall defensive effort. The Patriots mixed up their fronts and at times, Guy shifted over to a DE spot and was outstanding, as the front seven was overall against the run. Josh Gordon: His Patriots debut in front of a loud and raucous home crowd was just a small sample size (18 plays), but a successful one. His two catches were both on third down which signals that Brady wasn’t afraid to go to him right off the bat. Injuries: On a short week, with a game on Thursday night against the Colts, there are three injuries that need to be monitored. Rob Gronkowski, who was nursing an ankle injury before the game, left in the third quarter when he re-aggravated it. Elandon Roberts who played a very solid, active game at middle linebacker left with looked like a fairly serious ankle or foot injury. Adam Butler was also injured in the second half and was on the ground in obvious pain. 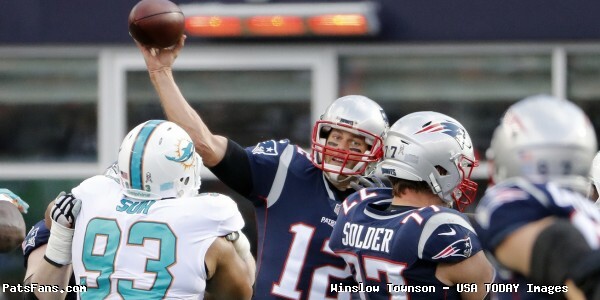 Brady Decision Making: On what was otherwise a very good game by Tom Brady, he was victimized by the ball-hawking Dolphins secondary twice in the game, and both could be characterized by poor decision-making. His first pick was actually a play where Brady was fooled by the Miami coverage. Bobby McCain was running with Chris Hogan on a deep post. Phillip Dorsett was supposed to cut inside Hogan for a deep cross. But McCain passed off Hogan to the safety and sat right in the throwing lane. He made a smart heads-up play for the pick. On the second interception, Brady just got too greedy up 38-0 and tried to force the ball into tight coverage when he should have just thrown the ball away. It may be just a tad nitpicky here, but these are the kinds of mistake we generally don’t see from #12. 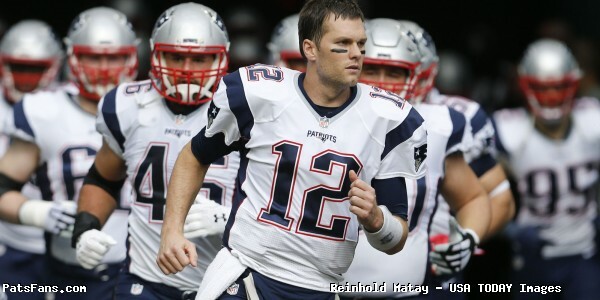 This entry was posted in 2018 Patriots Regular Season, NFL Commentary, NFL News, Patriots Commentary, Patriots News and tagged 2018 NFL Season, 2018 Patriots season, Bill Belichick, Bobby McCain, Chris Hogan, Cordarrelle Patterson, Danny Amendola, James White, josh gordon, Julian Edelman, Kenny Stills, Miami Dolphins, New England Patriots, NFL, Patriots, Patriots edge rushers, Phillip Dorsett, Rob Gronkowski, Ryan Tannehill, Sony Michel, Tom Brady, Trey Flowers on October 1, 2018 by Steve Balestrieri. A funny thing happened on the way to another home blowout win over the Dolphins on Sunday. 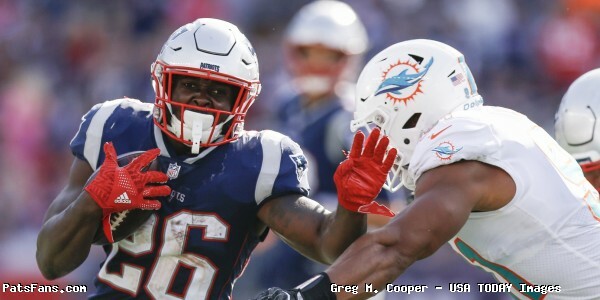 Miami regrouped in the second half as Ryan Tannehill was tremendous in the final 30 minutes and the Patriots needed a Duron Harmon interception in the end zone with two seconds left to preserve a 31-24 win on Sunday at Gillette Stadium. With the victory, the Patriots improve to 2-0 and are a game up in the division over the New York Jets. Miami and Buffalo are already two games back at 0-2. The Patriots got off to a lightning fast start with Jimmy Garoppolo eviscerating Miami’s defense. 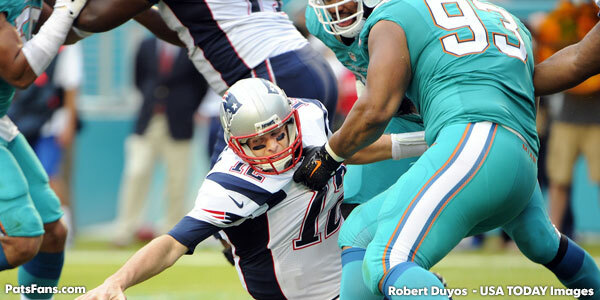 In the first quarter, the Patriots outgained Miami 204 -12. Jimmy G. looked positively Brady-esque completing 18-27 for 234 yards and three touchdown passes in the first half as the Pats raced out to a 24-0 lead before Miami knew what hit them. He threw a pair of touchdown passes to Danny Amendola and another to Martellus Bennett in the first half. Jimmy Garoppolo is in obvious pain after injuring his right shoulder during Sunday’s game. But his last completion as he rolled out to his right was a costly one. Kiko Alonso hit him and drove him to the turf as he let go of the pass and Garoppolo hit the turf hard on his shoulder. He was immediately helped off the field and didn’t return. The good news was that X-rays came back negative although he was reportedly in the hospital, presumably to get an MRI. His leaving ignited the Dolphins who drove down to kick a field goal at the end of the first half and carried the momentum into the second half. Jacoby Brissett took over and played ok, completing 6-9 for 92 yards in relief and will undoubtedly get his first NFL start on Thursday against the Houston Texans. Miami’s offense made adjustments in the second half and their wide receivers were all getting open. Tannehill went to the no-huddle attack which stopped the substitutions by the Pats and wore down their pass rushers who got very little pressure down the stretch. Tannehill ended up going 32-45 for 389 yards, 2 TDs, and 2 INTs. Both Jarvis Landry and DeVante Parker went over 100 yards receiving as Miami stormed back from a 31-3 deficit in the third quarter to 31-24 with about six minutes to go. 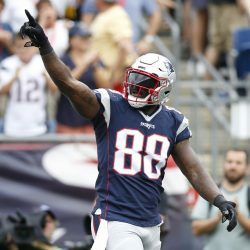 Blount, Bennett Shine: The Patriots got tremendous games from both RB LeGarrette Blount and Martellus Bennett this afternoon. 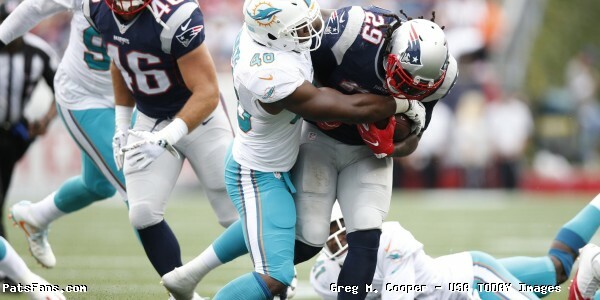 Blount started slowly but he gradually began to wear down the Miami defense. He ended up with 29 carries for 123 yards and a touchdown, a nine-yard run up the middle to open the third quarter. Blount had another highlight reel play when he hurdled Dolphins CB Byron Maxwell early in the fourth quarter. The 26-yard run put the Patriots in good position at midfield but a penalty on Joe Thuney killed the drive. The Patriots want him to be a closer and he was particularly effective doing just that. With 6:06 left the Patriots began on their 25-yard line and the Dolphins knew they were going to run but Blount was the major factor in the Patriots driving to the Miami 26 before they stalled with just over a minute to go. Normally a chip shot field goal, but he pushed it wide right and what should have been a clinching drive gave Miami a final chance. Martellus Bennett had a huge game on Sunday. Bennett played a heck of a game a week ago as a blocker, this week he was leaned on more as a pass receiver and was outstanding. 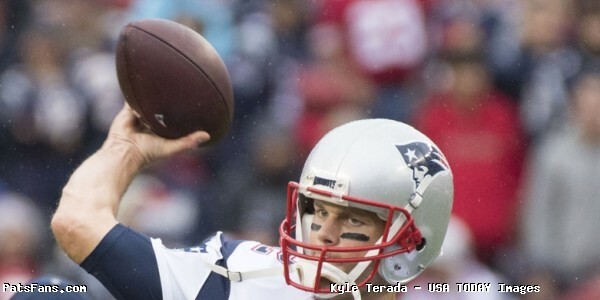 He caught 5 passes for 114-yards including a 20-yard scoring pass from Garoppolo in the first quarter. He also caught a huge 16-yard pass on the Patriots final drive to keep the chains moving and to give them the opportunity to kill the clock further. Defense Must Improve: After a mainly very impressive first half, the defense was picked apart by QB Ryan Tannehill. Tannehill went 22-27 with 273 yards and two touchdowns in the second half. He and coach Adam Gase made their adjustments, going to a shorter passing game and he was on fire in the second half. After falling behind 31-3, the Dolphins scored touchdowns on their next three drives — 21 unanswered points to make this one a nail-biter. Kenny Stills had a 24-yard touchdown catch with 5:45 left in the third, on a play where Miami’s RT Ja’Wuan James jumped way before the snap and should have been called back for a false start. Jordan Cameron had a 12-yard touchdown catch early in the third between two defenders (Pat Chung and Jamie Collins), and then Kenyan Drake had a seven-yard touchdown run with 6:06 left in the game. Drake’s touchdown caught the Patriots in a blitz from the left side, as Miami ran to the right and Drake scored easily. The secondary wanted to keep the play in front of them and avoid the big chunk plays. But in effect, they did neither in the second half. Parker and Landry were consistently beating the corners off the line and the Patriots pass rush was mostly a non-factor in the second half. Chris Long had a good game, providing good QB pressure and recovered a fumble. Special Teams Letdown: After being largely responsible for the win a week ago in Arizona, the Patriots STs were partly to blame for the game nearly going to overtime. When a field goal would have put the game away with a minute to go, Stephen Gostkowski has to make that kick. A 39-yarder is little more than an extra point for him and was a huge miss at crunch time. He’s normally as automatic as there is in the NFL. Ryan Allen’s punting was poor on Sunday. While he did down two inside the 20-yard line, his four punts went for an average of only 32 yards with a long of just 37. Miami took a page out of the Patriots book and mortar kicked to Matthew Slater who could only get back to the 18-yard line. Danny Amendola was the lone bright spot returning three punts for 33 yards, including a 19-yarder. Now with the Patriots facing a very short week and the Houston Texans coming to town on Thursday, there is very little time for Brissett to get ready to now be elevated to the starter’s position. 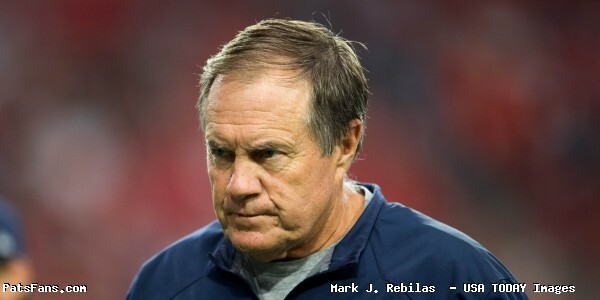 This entry was posted in Patriots Commentary, Patriots News and tagged Adam Gase, Bill Belichick, Chris Long, Danny Amendola, Devante Parker, Duron Harmon, Jarvis Landry, Jimmy Garoppolo, Julian Edelman, Kenny Stills, LeGarrette Blount, Malcolm Butler, Martellus Bennett, Miami Dolphins, New England Patriots, NFL, Ryan Tannehill, Tom Brady on September 18, 2016 by Steve Balestrieri.